Welcome back to the Sushi Joa blog! Last time on our blog, we wrote about how sushi actually has a lot of health benefits. Read our last blog post here, or keep reading to learn why you should come visit your local Japanese Restaurant in Kirkland. 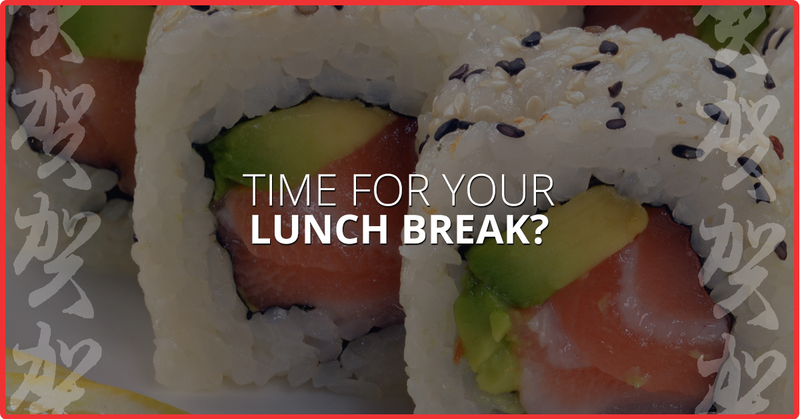 Is it about time for your lunch break? Are you looking at a unappetizing iceberg lettuce salad in an old, worn out Tupperware container that you inherited from your college roommates years ago? Or, did you forget your lunch and are contemplating a dining experience straight from the vending machine? Just say no to all of these options and come in to Sushi Joa! Why? Keep reading! Sushi is a healthy choice, as we mentioned above and discussed in our last blog post, sushi actually provides many health benefits. From the fresh fish that offer Omega 3’s to support a healthy heart, to seaweed that is rich in iodine that helps to balance hormones, sushi provides nutritional support to the entire body — and is delicious! Also, the protein in sushi boosts your metabolism and the antioxidants found in wasabi and ginger provide cancer-fighting benefits. Your body and your taste buds are craving sushi. Indulge them! Getting out of the office is healthy. Are you the type that feels like you never leave your desk and that being stuck to your desk is a means for getting your to-do list accomplished? Actually, contrary to popular belief, working without breaks will not give you the best productivity. Your mind and body need time away from your work to rest and rejuvenate so you can continue working all day. Your brain actually can solve problems better when you take breaks and when you are doing low mental activities such as eating, walking, and showering, your brain is able to solve problems. Ever feel like you always have the best ideas in the shower? There’s a reason! Quality time with friends and coworkers. Life is busy for everyone. Whether we are sitting glued to our desks, running errands, or washing our mountain of laundry so we can look presentable, we always have something to do and it can be hard to find time to spend with family, friends, and your favorite coworkers. Lunch is the perfect “excuse” to take time out of your day and meet up with those that you haven’t talked to in awhile. Everyone has to take time to eat, right? Why not really take your mind off of work and head over to your local Japanese restaurant and enjoy time with friends and some great tasting food.Ready to take your sushi lunch break? Come to Sushi Joa in Kirkland to enjoy fresh eats and sweets that will nourish your body and delight the taste buds as you take a well deserved break from work. View our menu online!